Baking with fruits is a new phenomenon in my kitchen, which started last year. Thanks to the blog world and those luscious summer bakes that you clicked and presented and which made me droooool in all its true senses. Before that the frugal me never thought of buying those packs of overtly priced strawberries or cherries. They looked oh so luscious from a distant with a divine aroma but when bitten makes you throw it as soon as possible for its more sour than lemon taste. But anyways Hubby wanted to try them and brought a packet when they were offered at half their original price. After looking for a good recipe to fit our circumstances I got one based on David Lebovitz’s. it was easy to assemble and called for very few things. So on one weekend night when the hubby was busy putting the baby to bed I made this to jazz up our healthy meal of Moroccan Harira. And boy did we like it??? We were totally floored with the union of this just out of the oven hot cherry-berry cobbler with vanilla ice cream...a match made in heaven. Since then I have made it several times and every time I wanted to post the recipe. But just the thought of the cobblers cooling down made me sick. I wanted to enjoy the whole experience of scooping out a small spoonful of the bubbling fruit sauce with the soft buttery biscuit and then seize a tiny bit of melting vanilla ice cream and putting the dripping spoon in my mouth. Trust me its heavenly and by no means I could ever let it go, NO, not even for my blog. 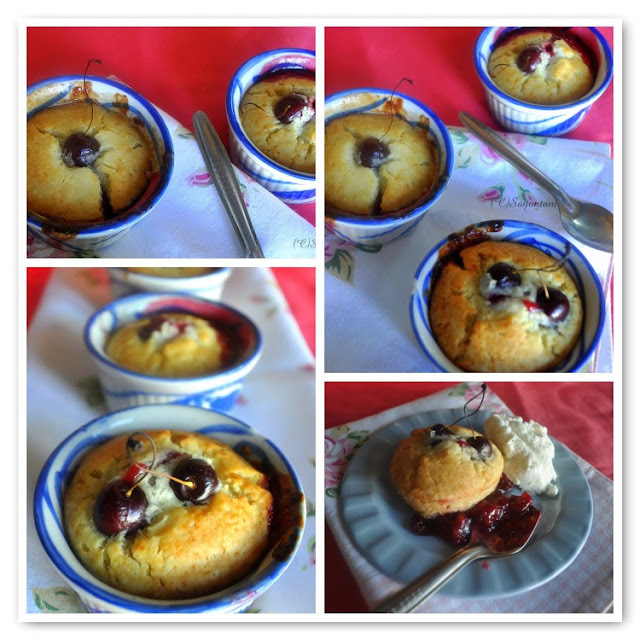 But this time when Hubby got a big packet of cherries from New market and we enjoyed the cherry cobbler for dinner for back to back two consecutive days….I finally was ready to click this blissful dessert for my blog. So I took out the linen I planned for the shoot, wiped the spoon and charged my camera battery. However, once the cobbler was ready the scene was different. Hubby quickly grabbed one ramekin and asked me to manage with the other three. It’s always difficult to shoot a great dessert which is supposed to be enjoyed hot what aggravated the situation of the greedy hubby licking his spoons clean in front of me. After blaming him that he doesn’t show any support to my blog finally the foodie in me could not resist. I finished the shoot in hurry with whatever was in front of me. So now, you know whom to blame for these lousy pictures. Right!!! But take my words on the recipe. Do yourself a favor a make a batch of this wonderful summer fruit dessert, and no matter what enjoy them hot. To prepare the fruit filling, cut the fruits in half remove the stone and chop them in small pieces. Mix in all the other ingredients for the filling. Transfer this to a oven safe big bowl. The sauce will bubble up to a large extent so don’t forget to place the fruit filled bowl on another oven safe tray or plate to catch all the drippings. Cook for 30 minutes (stir once or twice in between) or till the sauce is all juicy and smooth. If you plan to bake the cobbler in individual bowls or ramekins then divide the filling accordingly or transfer to any other tin you want to bake the cobbler in. To make the biscuit, mix all the dry ingredients in a big mixing bowl. Cut the butter in and with your finger tips rub the butter in the flour till coarse crumb like texture is achieved. Pour the buttermilk and mix everything very gently to just moisten the dry ingredients. Scoop the biscuit on the fruit filling. If you wish you can brush the top with egg wash and sprinkle more sugar on top. I dint do this. Bake for 20-25 minutes or till the top is golden. Serve immediately with scoops of vanilla ice cream. similarly you can use peach, apricot, strawberry, blueberry or nectarines. Sending this to fast food not fatty foods hosted at Zesty palette. hi Dear, the cobbler looks so great, inspite of a sore throat i'm ready to have it with the ice-cream. I hope u have left the link of ur eggless cake in my space for winning the giveaway. Wow!!!! looks very delicious and soft muffins. Delicious and yummy looking muffins. Can't stop resisting drooling over it. Cobblers are my fave too. Love experiment with different fruits. It looks lovely like a pie in the ramekin. Cobbler looks absolutely tempting..beautiful clicks.. The cobbler looks great. Yumm!!! Delightful dessert ~ so apt for summers! All the fruits you mentioned are easily available , will try making it...looks so delicious and yummy!! Looks delicious! Love the combination of flavours and textures! Cobbler looks soft, spongy, yummy and tempting. Very nicely prepared. Wonderful presentation. awesome cobbler recipe...I love it! I was wondering what to replace the cherries with and thanks to your notes on that. Love the last click. I feel ready for it. Delicious cobbler absolutely very tempting. Love the wonderful crust of the cobbler! And cherries stole my heart. Yum !! I tried a peach cobbler once, and yes, that was the first time I bought peaches...These clicks are good !! Its hard not to give into temptation !! what a droolworthy cobbler, with cherry and plum..yumm.. loved your pics. Cherry plum cobbler looks delicious. Looks superb, simply love it. you have a lovely blog. 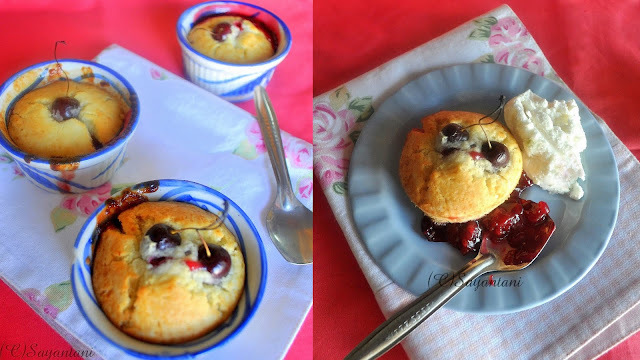 cobbler looks yumy and love your clicks. happy to follow u..
looks so Yummy....and no eggs....I should try my hand on baking...I have seen ppl using buttermilk as substitute..really it looks good...following you. Wow, looks fantastic & absolutely drool worthy! I love it. Sayantani, I liked your blog a lot!! Khuuub bhalo laglo! The cobbler is looking so tempting dear! Way to go!! Looks soo delicious..every picture is screaming "eat me, eat me if you can" :-D...banate hobe ek din eyi cobbler ta..
Cobbler looks yummy. Lovely clicks. For the blueberry oat bars I think any berry would work. nice pics..cobbler looks absolutely yummy!! This looks so yum !!! The cobblers are really delicious. Perfectly done. I love making cobblers at home! Never tried the cherry and plum combo though - sounds delish!